"I know I ask for prayers a lot. But isn't that what we're supposed to do? When I sat down to write this letter, I looked through some of our previous cancer-related mailings. 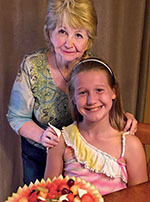 I came across a story about a cancer survivor, Nancy Robinson, whose story was so inspiration. Nancy's life story is just as inspirational today as it was several years ago. In 1999 Nancy was diagnosed with cancer of the tongue. Doctors gave her one year to live. But Nancy didn't accept their prognosis. Instead, she decided to battle her cancer in two ways - with medicine and with prayer. And it worked! Nancy said prayer was just as important as radiation in her victory over cancer. She explained: "I know I ask for prayers a lot. But isn't that what we're supposed to do?" Nancy's struggle has not been easy. She has endured more than a dozen surgeries, and part of her tongue has been removed. But Nancy doesn't dwell on what she has lost. She knows that prayer and medicine have given her a new lease on life. In 2008 she opened her own custom cake studio, and it flourished. Nancy says she prefers to see the glass half full because God has control of everything that happens. She lets the doctors take care of the medicine, while she takes care of the prayers. Nancy reaches out for prayers through Facebook. And prayers come in from everywhere - mostly from people she doesn't even know. "People send me messages that are so inspiring, and I love sharing them with others," says Nancy. "It gives us hope, and reminds us not to get discouraged." Nancy has recently retired from the cake shop. Today she enjoys spending time with her family, especially spoiling her grandchildren. Nancy continues to be an inspiration to everyone around her, a special person filled with faith, perseverance and hope. Please join me in prayer for person who are struggling with cancer. They may be a patient, caregiver, family member or friend. Here is how we can together raise our prayers to Jesus, our life, our hope and our healer. My brother Oblates and I will remember your loved ones affected by cancer in our prayers. Please send your petitions so together we can lift up your loved ones in prayer. Your petitions will be placed before the Angel of Healing and Hope at the Shrine Church. On the second Tuesday of every month at 7:00 p.m. a special Mass for healing with the anointing of the sick is celebrated at the Shrine as we embrace in our prayer all those who are in need and particularly those affected by cancer. After the Mass, we invoke the intercession of St. Peregrine, the patron saint of cancer victims, on all those whose names were sent to the Shrine and we offer to venerate his relic. Please send your loved ones name to be remembered on the Healing and Hope Prayer Chain.